Forced into marriage by her family and abandoned by her husband, Anna vowed to never again be anyone’s pawn. Her only weakness might be the love she still harbors for the man who betrayed her. A wicked and deceitful plot brought about the unwanted marriage between young Anna Locke and Jude Sinclair, the handsome son of an earl. Furious over his new circumstances, the groom left his bride and England behind to travel the world. When he returns after eight long years, his first intention is to put an end to his farce of a marriage once and for all. But he never expected the woman his wife has become, or his fierce attraction to her. Living by her own rules, Anna has achieved success and independence as the owner of the finest Thoroughbred stables in Britain. She believes herself long-cured of the childish infatuation she’d once held for the man who married her and left her. 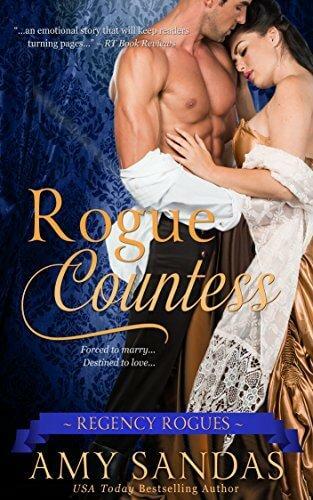 With her husband’s unexpected return, Anna’s first desire is for revenge, but she soon realizes that she faces a difficult choice between fighting him and fighting for him. With a past tangled in lies and blackmail, Anna and Jude declare their marriage a battleground as passionate anger slides too easily into bold desire. To claim the love that could be theirs, they must overcome mutual distrust and destroy a long-held secret before it destroys them. Rogue Countess received the Coffee Time Reviewer's Reccomend Award! Read the full review here.